Well I’ve done it, I’ve entered my “Bucket List” race in Mexico, the Copper Canyons Ultra Marathon! The race is early March 2013 so I’ve plenty of time to train, though I’ll have to modify my training as the race is 50 miles, has 10,000 ft of ascent / descent and is likely to be pretty warm. 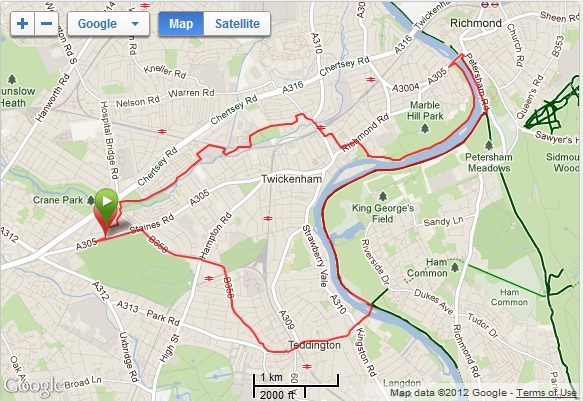 Lots of running up and down Richmond Hill in the winter wearing 10 sweaters I suspect! It is a 50 mile Trail Ultra marathon that was made famous in Christopher McDougall’s book “Born to Run”. The following film, though a couple of years old will give you an idea of the people and the area. Some of the footwear may look familiar too! Sadly the main character in the book and the founder and race director of the Copper Canyons Ultra Marathon, Caballo Blanco (Micah True) died earlier this year after going out for a run in New Mexico. I think it may turn into a celebration of his life and the event he started. Maybe I should start tequila training as well? Below is a link to an excellent video taken by a runner who did the run in 2 days (camping overnight). Ah seeing all that water brings back memories, plus I get to see what I ran past in the dark! 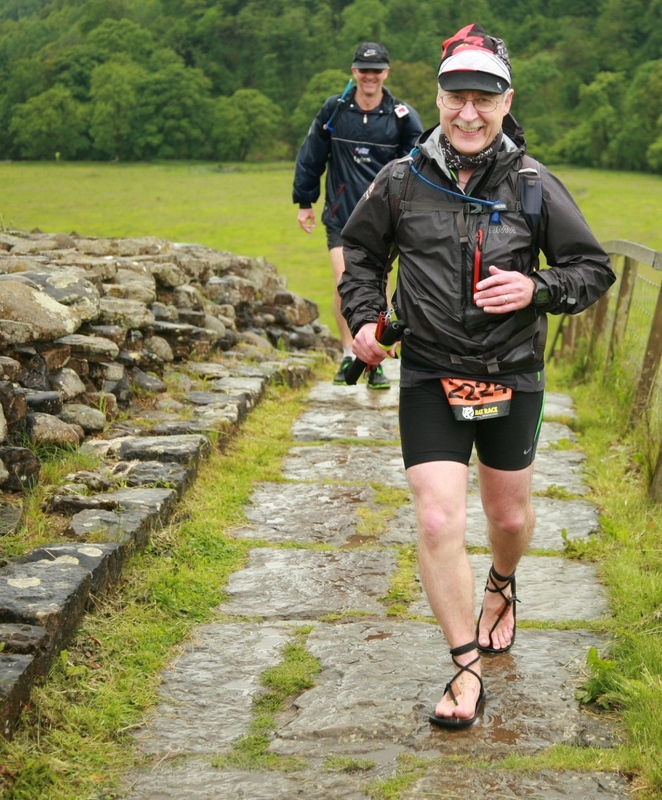 My neighbour, fellow runner and Ring O’Fire Ultra http://www.ringofire.co.uk/ Race Director James has registered for his next challenge, The Thames Path 100 http://www.centurionrunning.com/thames-path-100-2013/. 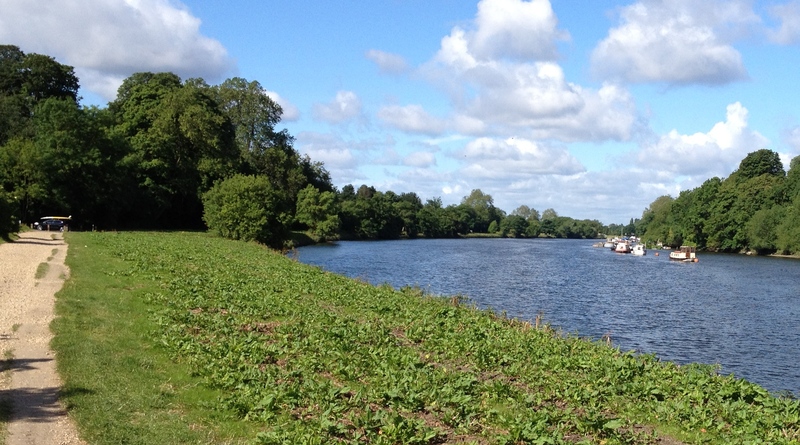 This is a 100 mile foot race along the Thames from Richmond to Oxford. He kindly invited me to join him but as it is only 3 weeks after Copper Canyons Ultra I had to decline. 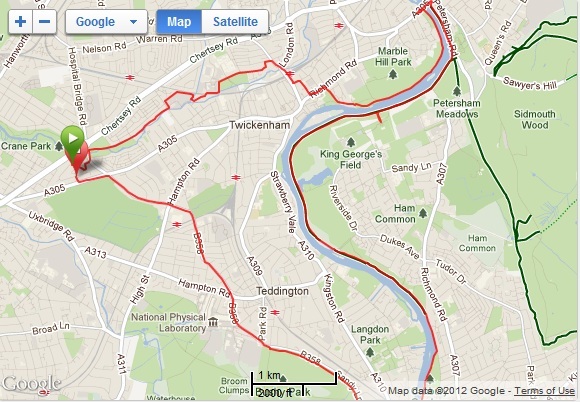 However I have offered to pace him for the last 30 miles (Streatley – Oxford), which will probably be during the night. Hopefully he will have slowed down by then so I can keep up! 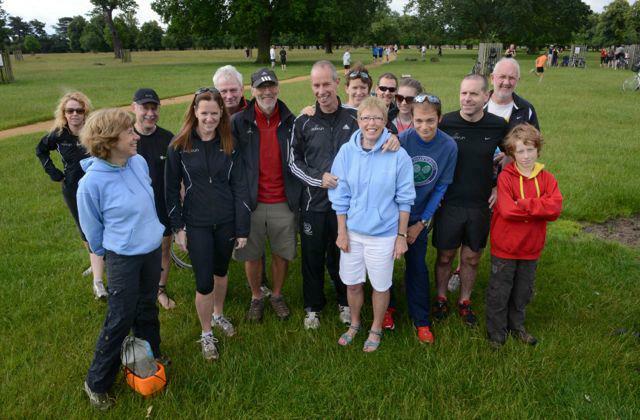 It was good to start my regular parkruns every Saturday having stopped for a month prior to “The Wall” to avoid picking up an injury in my customary 100 metre sprint finish each week. We are still getting fields of mid 800+ and so far the “double funnels” are holding up. It was good to get out on Wednesday as the weather has been very wet. I took a chance on my normal circuit, but hedged my bets and wore my VFF KSO Trek as if if got very muddy they would be better than my Luna’s. 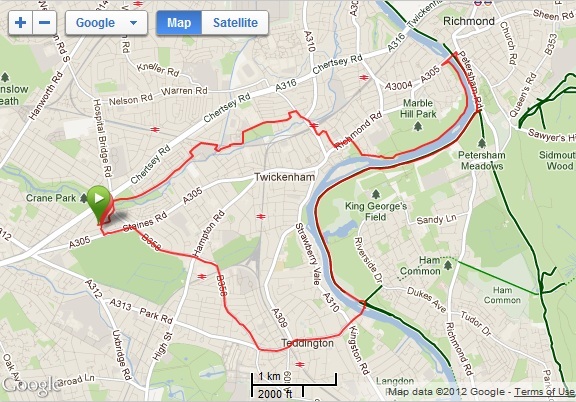 Rain did hold off but the path got pretty muddy once I crossed over at Richmond and reached the overground section. 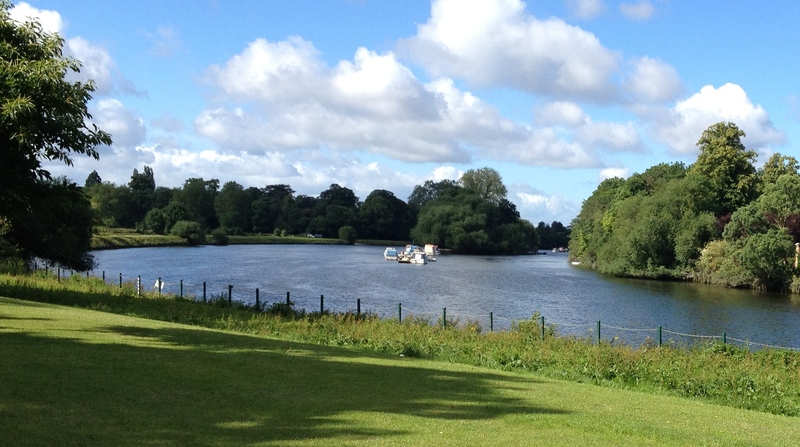 But it was worth it for the occasional break in the tree cover to look across the river and the sunshine, it was raining but you can’t see it on the photo. A good and refreshing run. 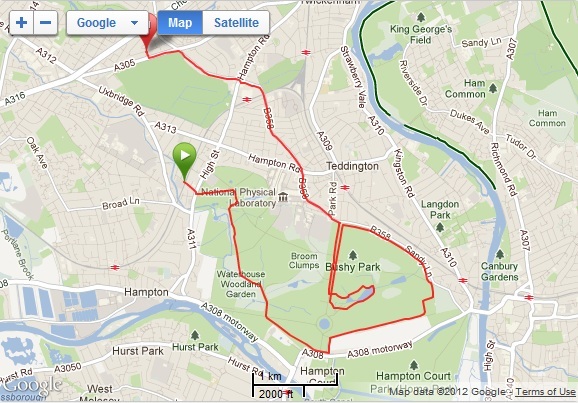 Alas a few more months and I’ll be back to running it in the dark with a headtorch again! 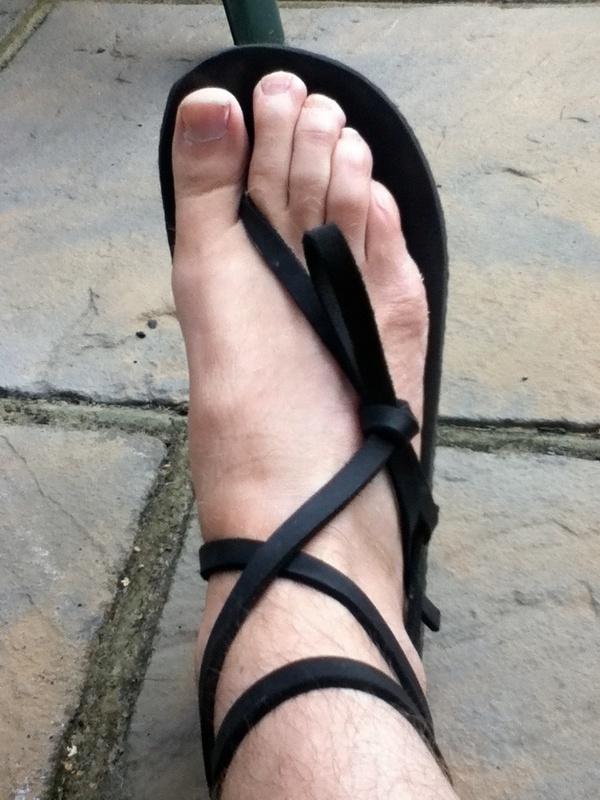 On Saturday 23rd June 2012 I ran the furthest I have ever run, 69 miles and 4,700ft of altitude, and I did it in my Luna Leadville Pacer Sandals (https://www.lunasandals.com/), and with the weather on that day they turned out to be the best footwear choice I could have made. 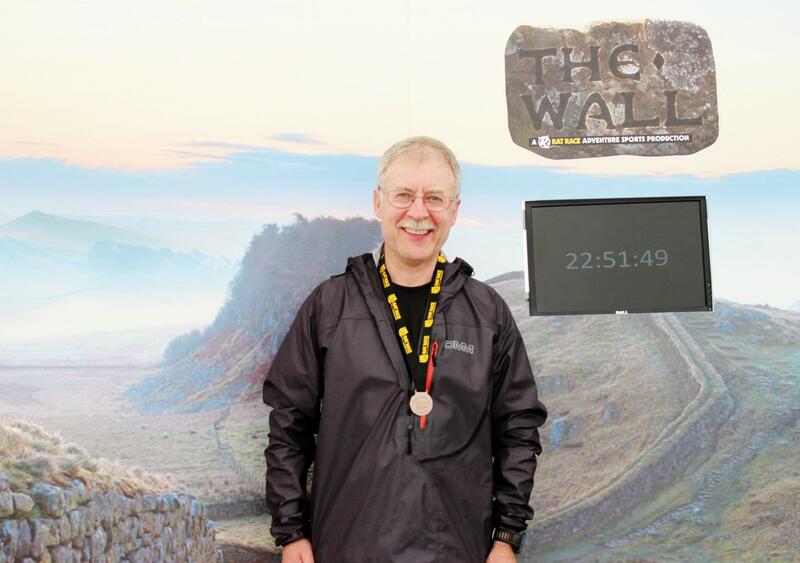 The race was called “The Wall” (http://thewallrun.com/) and was a 69 mile Ultra marathon along Hadrians Wall, a 2,000 year old wall which was the most northerly permanent component of the Roman empire. 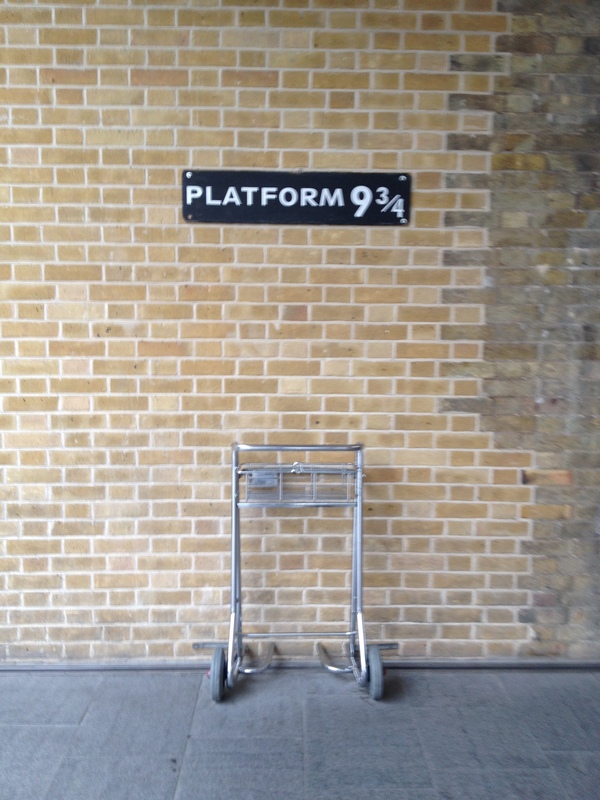 I set off from Kings Cross station on the day before, nervous and wishing I had some “magic” to help me complete the distance, but alas this is as close as I got (Harry Potter fans will understand). The start was from Carlisle Castle at 7am on Saturday (there was another start 1 hr later for those runners completing the race in 2 days, but the thought of running 32 miles, camping, and then getting up next day knowing I had another 37 miles to run didn’t appeal!). 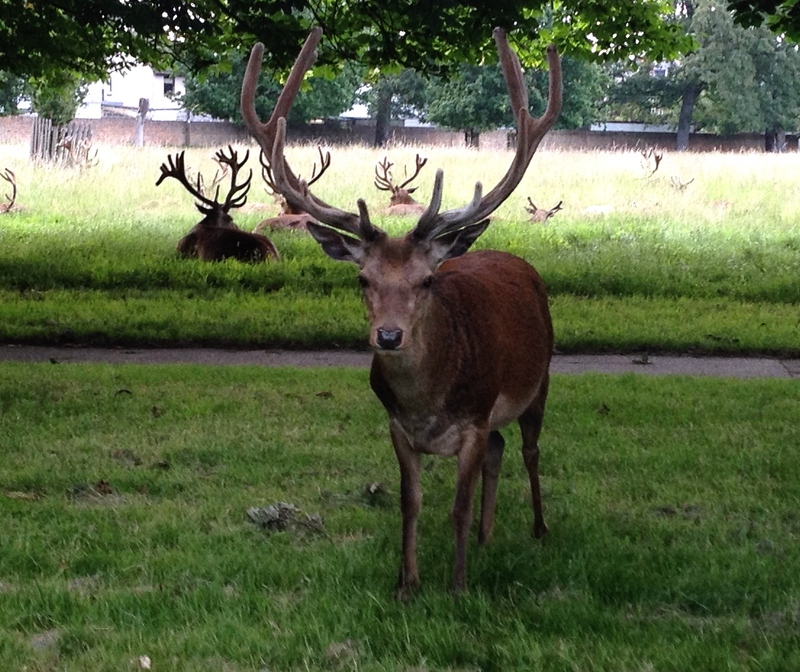 I was staying at a hotel close to the castle so after a light dinner (no exotic or spicy food for me that evening…….) I headed up to bed after setting 4 alarms on my iPhone and booking a hotel call for 5:30am (they had laid on an early breakfast for 6am as there were quite a few runners staying). 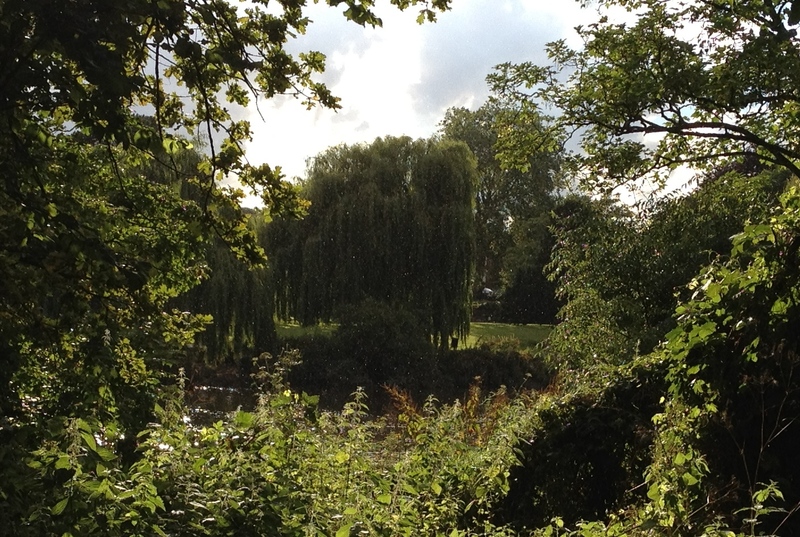 Ugh, my various alarms went off and I pulled back the curtains to see …….. rain! I showered (whilst thinking why am I doing this, I’m going to be getting wet for the next 20-24 hrs?) dressed and went down for some toast & tea. The topic of conversation amongst the runners was….you guessed rain, and what to wear / carry. On return to my room I surveyed my 3 bags, my running rucsac, my drop bag, roller bag. I was running in my Luna Leadville Pacer sandals (traditional leather laces), shorts and a short & long sleeved technical top with my OMM waterproof on top. I was in trouble if it did stop raining as I had nowhere to put all this stuff as my bag was already full! My running rucsac had food (Clif Shot Bloks & Clif bars), 2 litles of Nuun in my Camelbak, mandatory first aid and safety kit, spare warm top and waterproof trousers for when I get cold in the early hours. I had also packed my headtorch, just in case my drop bag (with spare clothes and more food) didn’t make it to the halfway pitstop at Vindolanda. I was also carrying a pair of Mountain King “Trail Blaze” running poles (http://www.mountainking.co.uk/) which were so light I intended to run with them folded in one hand, getting them out for any steep climbs (I did an ultra earlier in the year where I was picking up bits of wood to help me up steep climbs in a forest, so I was not doing that again) and when I slow to a walk for the latter stages of the run. 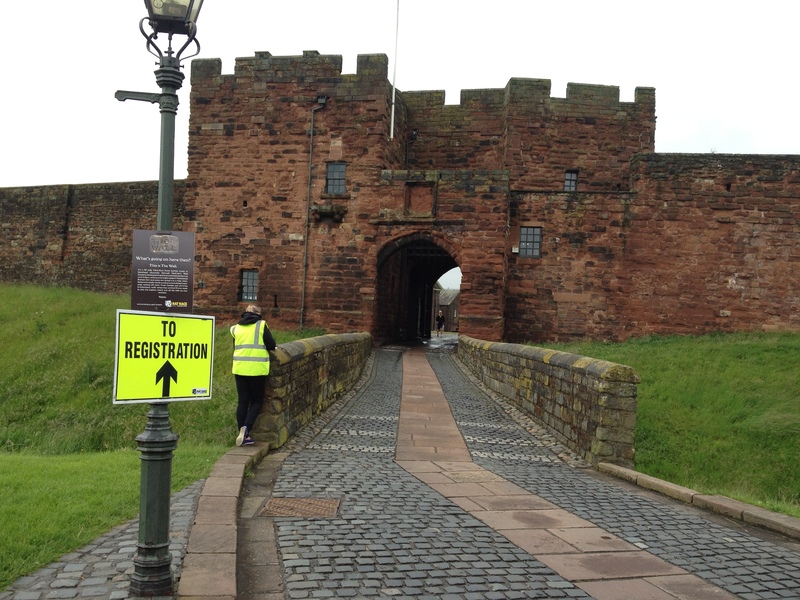 I grabbed my bags and headed down to the start at Carlisle Castle. 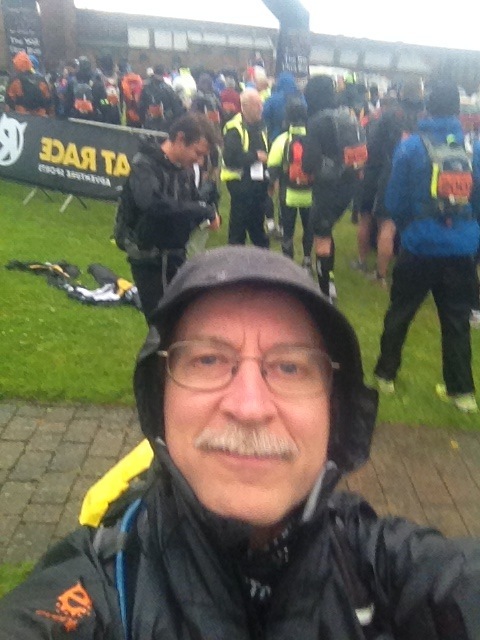 It was pretty miserable at the start with around 200 people (around 200 are running it in 1 day and 600 are running over 2 days) muttering about the rain and unpacking waterproofs. Fortunately I had bought my Aquapac waterproof iPhone case so I should be able to take pictures, even if the quality is sometimes not that hot (see below). As usual I got lots of strange looks due to my footwear, but I did see one person in VFFs. The start was delayed for around 20 minutes but we eventually got under way (after some “stuff our lawyers make us say” type talks by the organisers) by around 7:20am. The first few miles wind around streets and parks next to the river, which I got my first inkling as to what was in store. Water, lots of water. The river had flooded (and was about to break its banks again), the result of which was all the paths near the river were under 8-9 inches of water. I had great delight in running through these flooded areas whilst all “shod” runners queued and tried to thread their way around the water trying not to get their clean trainers and socks wet. It wasn’t long before the looks of puzzlement at my strange footwear turned into looks of envy as I ran through the water, shook my feet dry, and continued running on the paths (accompanied by cries of “stop rubbing it in!” ). Here are a few videos taken during the run. My nutrition and fluids seemed to work well (I was drinking about 0.7 litre per hour and eating 6 shot bloks per hour) from all indications (I’ll avoid further details you’ll be glad to hear). In the latter stages when the paths were alongside the river we were wading knee deep through the flooding (when we told the staff at the next aid station they said that the first runners through earlier in the day had to wade through water waist deep!). I was almost using my poles as a depth gauge as knee deep water was ok but I didn’t want a swim. I managed to last until 10pm before I had to get out my headtorch at which point I put on my warm top as I was slowing down and starting to get a bit cold. I reached the 62 mile pit stop at around 3:00am by which time I was consuming anything with caffeine in (Gu’s, shot bloks I mean anything to stay awake). I had a wonderful slab of chocolate flapjack and nearly fell of the chair with sugar rush. In fact I really did fall off the chair(I think I fell asleep for a second before the sugar hit). A quick cup of tea and then I and another runner who was continuing (we left several “youngsters” behind who were dropping out) left together to cover the last 7 miles that seem to take forever. Boy was I glad I had poles now. It even started raining again as the sun came up so I stopped to put on the waterproof trousers to fight off the cold for a few more miles. It was ironic that the warmest part of my were my feet, and they were bare! I crossed the finish line in Newcastle at just after 6am, exhausted, hungry but grinning from ear to ear at what I had accomplished, and very impressed with the organisers of the event (http://www.ratrace.com/run/) who had to cope with some appalling conditions on their first Ultramarathon along “The Wall”. 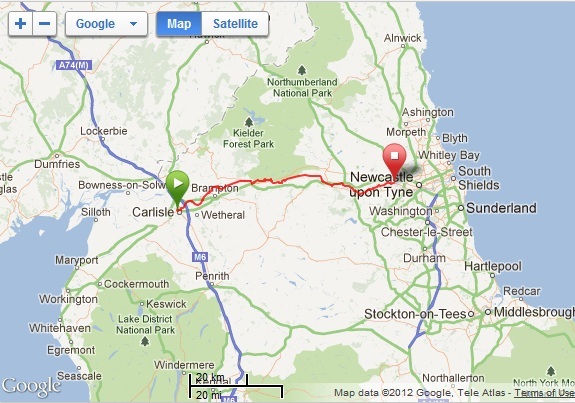 Now this event was entered with one objective in mind, to prove that I can run over 50 miles, and why? Because I want to travel to the Sierra Madre mountains in Mexico to run the Copper Canyons Ultra Marathon (CCUM) in March 2013 (made famous in Chris McDougall’s book “Born to Run”). 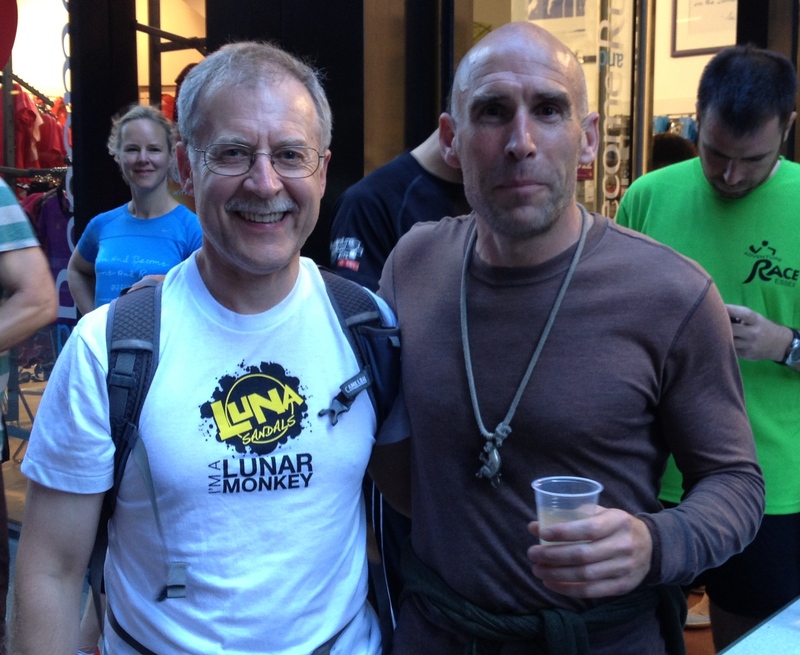 I met the main character in the book “Caballo Blanco” in London last year and he referred to me as the “2013 guy” (he tried to get me to run it in 2012 but I declined as I needed more training). Regrettably Caballo Blanco (Micah True) died whilst running trails several months ago, making it likely that the event in 2013 will turn into a celebration of his life, the native Tarahumara people and place that he loved. Well it’s Fathers Day today and after what seems like days of non stop rain and high winds we have sunshine this morning, so I’m off for a run. 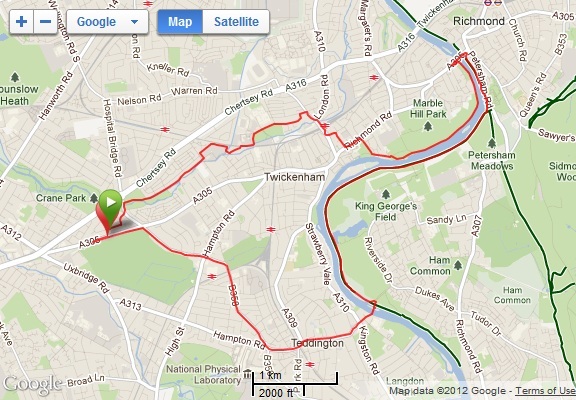 I decided on my usual midweek run of Twickenham to Richmond along the Thames, cross the river and back along the other bank to Teddington Lock, except this time I’ll carry on to Kingston bridge, cross the river and return home via Bushy Park. Should be around 12-13 miles. I tied on my Luna’s as usual, grabbed shot bloks and a bottle of Nuun and set off. The view across to Richmond Hill was impressive. 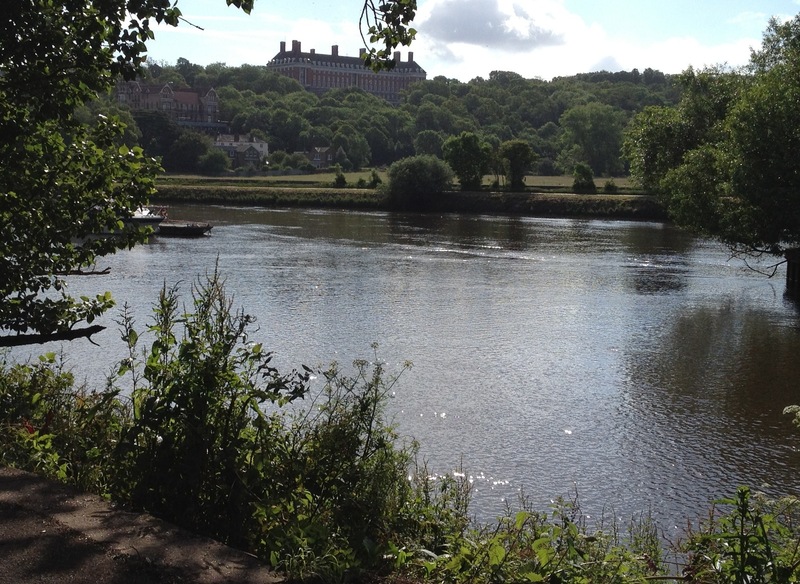 I reached Richmond Bridge, crossed over the river and turned right and started along the other bank towards Kingston. 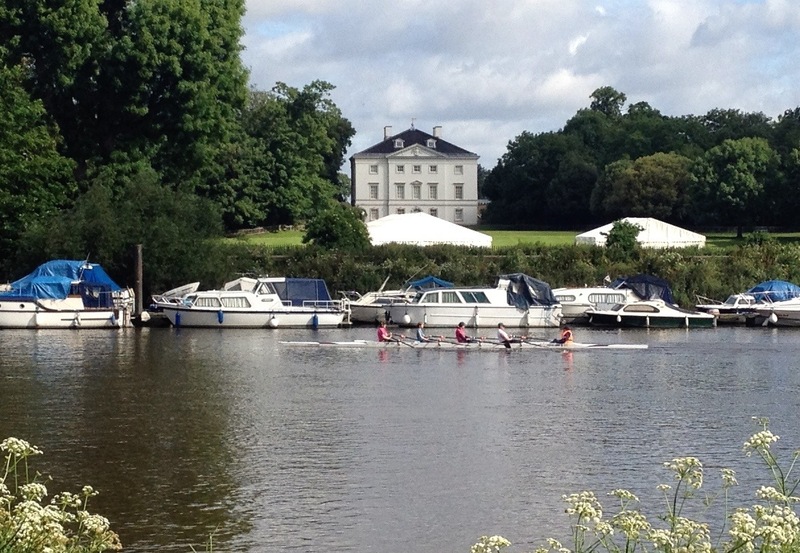 The rowers were out in force and You can see a 4 just in front of Marble Hill house, an 18th century villa in 66 acres built by King George II for his mistress Henrietta Howard. 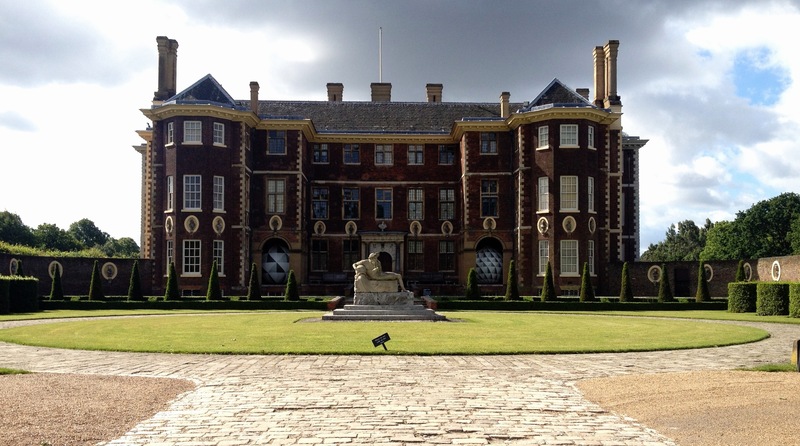 I carried on along the path running easily at around 10:15 min/ mile before reaching Ham House a 17th century house supposedly haunted. I had run this path several days earlier in the dark so was surprised to see a tree had fallen and been cut up to clear the path. It shows how windy it had been. 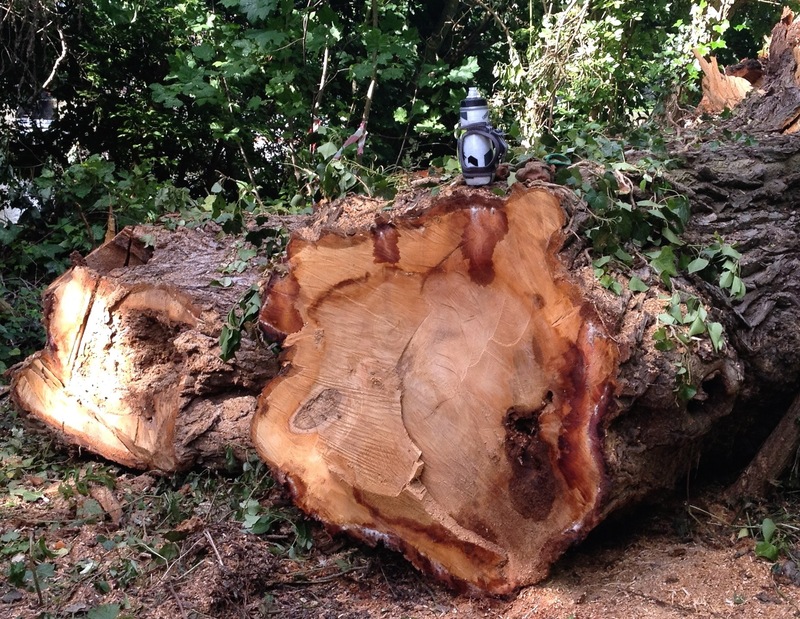 As you can see by my Camelbak bottle on top it was a fair sized tree and a real shame. I crossed back over Kingston bridge and joined the parkrun course in Bushy park at about half way, but running it in reverse taking me round to Teddington Gate. 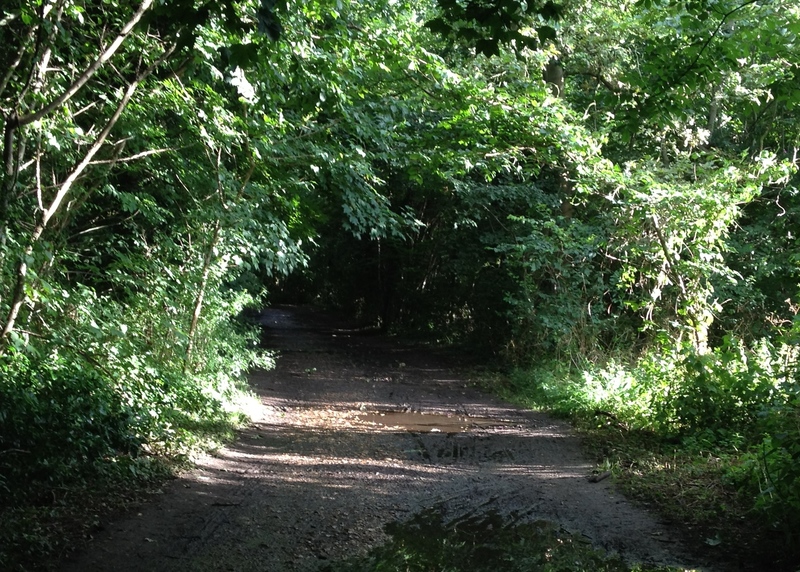 The last few miles along streets were a poor substitute for the great trails I had been running along the river. One more training run left before ‘The Wall’ ultra on Saturday.